Insert the seventh disc of the DVD set into your DVD player, then select "Special Features". 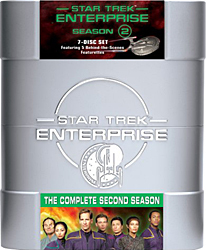 On the following menu screen highlight "Enterprise Moments: Season Two", then press your Left button. This will highlight a screen on the left. Press your Enter button now and you will see an interview clip with Scott Bakula talking about some of the people who have visited the Enterprise set, including Bill Gates, Luc Robitaille, and children from the Make-A-Wish Foundation, along with Bakula getting to meet Patrick Stewart and Brent Spiner. Go back to the "Special Features" menu now and highlight the entry "LeVar Burton: Star Trek Director". Now press your Left button. This will again highlight a screen on the left. Press your Enter button now and you will see an interview with Linda Park discussing Hoshi Sato's working relationship with T'Pol. Go back to the "Special Features" menu and access the second page of the menu, then select "Inside A Night in Sickbay". Press your Left button to highlight another screen on the left. Press your Enter button and you will see an interview with Anthony Montgomery discussing working alongside Morgan Freeman and spotting a visiting Whoopi Goldberg on the Enterprise set.